The Carmel Mission (Mission San Carlos Borromeo), founded June 3, 1770, by Father Junipero Serra, was the second in the California system of missions. Situated over the hill from Monterey and now surrounded by the city of Carmel-by-the-Sea, it is a rich historical resource and a reminder of the early days of California. Mission Carmel, formally known as Mission San Carlos Borromeo del Rio Carmelo, sits at the southern end of the City of Carmel-by-the-Sea which grew up around the mission. Father Junipero Serra had originally established the mission in Monterey, but relocated it to Carmel the following year to protect the natives from the Spanish soldiers. 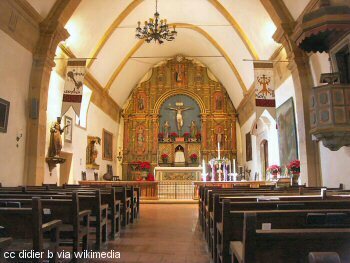 In the 240+ years since its founding, this mission, like most of the other California missions, has seen times of decline and rebuilding. Admission: (For upkeep and restoration) $6.50 for adults, $4.00 for seniors, $2.00 for children ages 7 and up (free for children under 6). Definition of "basilica": A Catholic church possessing great historical significance in the area and/or being an important site of pilgrimage and so decreed by the pope. Emblems of this rank are a red and gold canopy (conopaeum) and bells (tintinnabulum). The canopy of a minor basilica is furled. 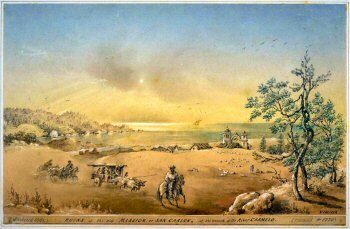 In 1821 Mexico ceded from Spain and acquired all of California. The missions and their property were taken from the Church and distributed to private individuals in 1834. 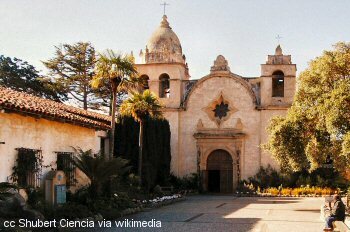 The buildings of Mission Carmel were left to decay and by the 1850's when California entered the Union, the main church and the other buildings were in ruinous disrepair. A "temporary" roof was placed over the church in 1884 and remained there to protect it until Harry Downie was chosen by the pastor in 1931 to restore the church and the other mission buildings. Downie continued on the project through the 1970's until his death in 1980. The Carmel Mission is unique among the California missions for its arched ceiling. The shape of the arch is called a "catenary" which is the shape of a chain when hung from both ends (here inverted of course). It is also one of the few California missions which was constructed of stone instead of adobe brick. There is a major restoration project underway which will enable the mission to continue to withstand the ravages of earthquakes and time. In addition to the main church, there are many other areas of interest. There are on display some of the rooms as they would have appeared in the 18th century. This is the refectory or dining room of the Franciscan friars. There is also the cells or private rooms which look very "spartan" and lacking in amenities which we today take for granted. This mission was the favorite of Father Serra, and this is where he died in 1784. Serra, along with several other Franciscans, are buried in the sanctuary of the main church. One of the beautiful and interesting things in the museum section is the cenotaph (empty tomb or memorial) of Father Serra. 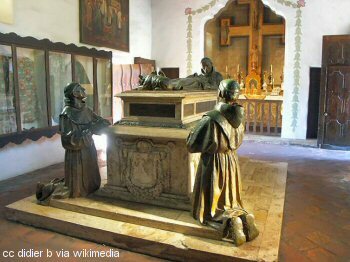 As mentioned above, Junipero Serra is buried in the sanctuary of the church and memorialized by the cenotaph created by Jo Mora. 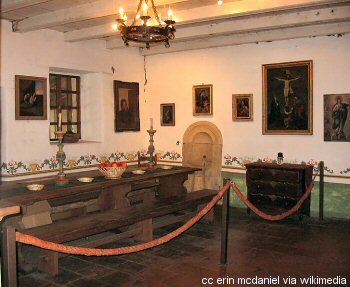 Mission San Carlos is considered to be the first library in the state. Just to the north of the main church is the Harry Downie museum, which was the workshop and office which Downie used during his renovation of the mission. Behind the church is a reconstruction of a 19th century settler's house that is full of period furniture and the day to day artifacts which gives an interesting insight into the lives of people of that time. 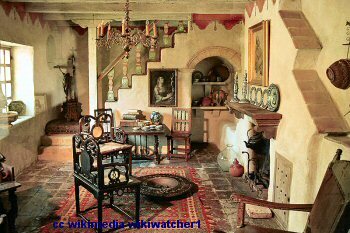 Depending on your level of interest in Central California history a visit to the Carmel Mission can be a short one or a full afternoon that transports you back to the time of the birth of the state and enjoyable in either case.